Is Chapman in danger for this? 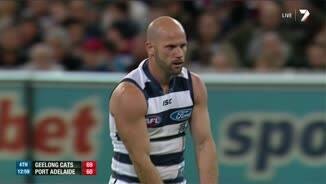 Cats InterchangeJosh Hunt off due to an injury. Power InterchangeJay Schulz off due to the blood rule. Cats InterchangeTom Hawkins off due to an injury. Port have a realistic chance of going to the quarter time break in front. GOAL POWERWesthoff with a wonderful kick to Monfries who is all alone and marks 20 metres out. Monfries goes back and kicks the goal to level the scores. GOAL POWERGeelong's defence turn it over to Boak who passes to Ebert 40 metres out. Ebert goes back and slots it through for a badly needed goal to Port Adelaide. GOAL CATSCorey kicks long to Chapman who marks in the pocket. Again Chapman plays on to open up the angle and again he kicks the goal. Port's defence were caught napping! BEHIND POWERHartlett creates an opportunity out of nothing and snaps, but he just misses. BEHIND CATSThe Power defence rush the ball through for a behind under pressure. Joel Selwood should go out and trademark the headband because more often than not he is forced to wear one due to the blood rule. Geelong have started with confidence after the disappointment of losing at home last week to Fremantle. Johnson handballs to Christensen running past and he kicks it out of bounds on the full. BEHIND CATSDuncan runs to the attacking end of the goal square and kicks to an empty goal square. The ball bounces smack bang into the post. GOAL CATSChapman marks Motlop's checkside kick and runs around to open up the angle and kick a brilliant goal. 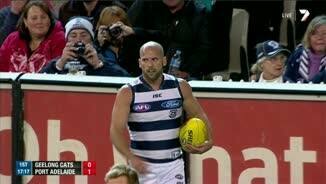 Hawkins wins an early touch of the footy in a good sign and a confidence boost for the big Cat. BEHIND POWERMotlop turns it over under pressure and Colquhon marks 40 metres out. He lines it up directly in front, but he misses to the right. 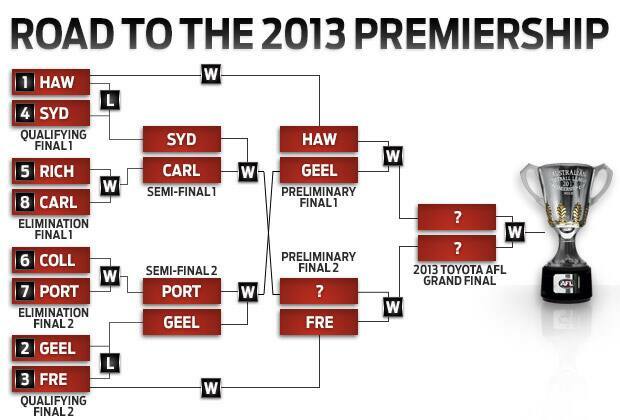 Who would have thought 2 months ago that Port Adelaide would be playing finals let alone win in the first week. Good evening and welcome to the MCG. Geelong v Port Adelaide awaits. The teams have been announced with Taylor Hunt and Aaron Young donning the lime vests. Welcome to MCG for the Geelong Cats v Port Adelaide Round 2 clash. GEELONG has survived a huge scare from a spirited Port Adelaide to book a preliminary final clash with Hawthorn, overcoming a 23-point half-time deficit to run out 16-point winners at the MCG on Friday night. 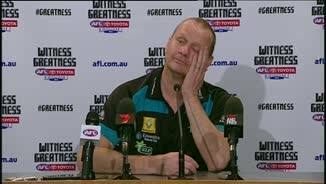 The Cats' 13.18 (96) to 12.8 (80) victory was soured after Paul Chapman was reported for rough conduct following a third-quarter bump on Port forward Robbie Gray. Chapman's contact with Gray was similar to Lance Franklin's bump on Sydney Swan Nick Malceski in round 23 – low impact but head-high – that earned the star Hawk a one-match suspension, sidelining him from Hawthorn's qualifying final win over the Swans. Chapman would be a massive loss if suspended, having put an injury-plagued season behind him to star for the Cats against the Power with four goals. 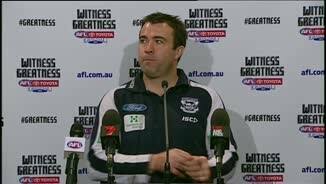 Geelong coach Chris Scott said he didn't see the incident where Chapman was reported, but added the Cats wouldn't "cry over spilt milk" if the veteran was suspended. "Every man and his dog is going to have an opinion on it," Scott said. "We'll bite our tongue and do what we need to do in the next couple of days." The Cats looked uncharacteristically flat in the first half as the Power outmuscled them at the stoppages and spread harder into open space. But Geelong looked a different team from the opening bounce of the second half after starting with Steven Motlop, Steve Johnson and James Kelly in attack. The Cats piled on five goals to one in the premiership quarter to go into three-quarter time seven points up, and looked home when they led by 23 points at the 21-minute mark of the final term. But two quick goals to Port, the first a spectacular banana from the boundary line by Justin Westhoff, put the Power back within 10 points with nearly three minutes left to play. Cats skipper Joel Selwood then put on a crucial tackle in the centre to stop another potential Port forward thrust, and Geelong hung on from there for its 10th straight win over the Power, a streak that began with its 119-point win over Port Adelaide in the 2007 Grand Final. Steve Johnson (25 possessions and two goal assists) was one of the catalysts for the Cats' comeback win, along with Motlop (25 possessions and two goals) and Mathew Stokes (28 possessions), who had 14 touches in the game-changing third term. James Kelly (28 possessions) and Selwood (27 possessions and one goal) did a power of work through the midfield for the Cats, while Tom Lonergan kept Jay Schulz to two goals. However, Tom Hawkins was quiet in his return from his lingering back injury, kicking two goals and taking just three marks (all uncontested). 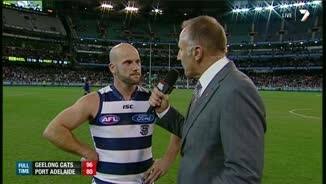 Scott put the Cats' slow start down to their poor ball use and the ease with which they allowed Port to create free players and hit the scoreboard, saying the Cats had played some of their worst football of the year over the last three weeks. "We needed to fix a few structural issues. They looked really dangerous rebounding the ball; too often when the ball went into a contest they won it and had free players everywhere," Scott said. "It's pretty simple. We needed to close them down in the second half to turn that around. "And to play some of our best footy is really exciting thing for next week." A week after upsetting Collingwood, Port lost no friends with a performance that suggests its young list has a bright future. Power coach Ken Hinkley said after the match he was proud of his team's effort. "I've been proud of our year, our commitment to keep on turning up and keep on challenging whoever's next and just having a crack," Hinkley said. "They certainly did that again tonight. "Early, we were right in the game. Obviously at half-time we talked and we knew the Geelong surge was going to come … we just couldn't hold up as much as we wanted to. "Their numbers and their run and their willingness to share the ball around and change the angles was pretty hard to control." 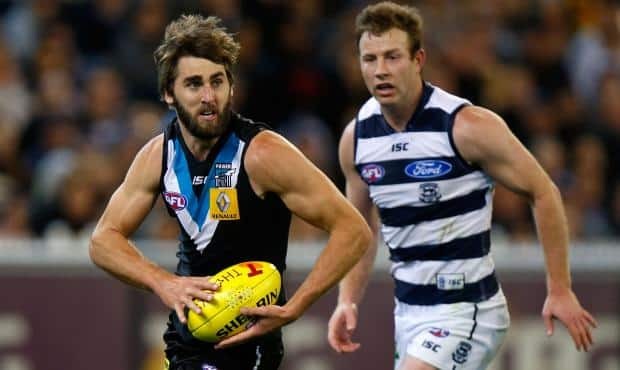 Westhoff (three goals and 19 possessions) worked extraordinarily hard at both ends of the ground, while captain Travis Boak (26 possessions) led from the front and was well supported by Matthew Broadbent (23 possessions and one goal) and Kane Cornes (21). The contest looked set to stick to a predictable script when the Cats jumped out to a 12-point lead at the 18-minute mark of the first term. To that point, Chapman had kicked the only two goals of the match, and Port's skill level had yet to catch up with its commendable pressure. However, the Power then started to find their targets and piled on the last three goals of the term to go into quarter-time six points up. Port carried that momentum into the second quarter, beating the hardened Cats in the clinches and running them off their feet in the open. The Power translated their dominance onto the scoreboard with a four-goals-to-one term that sent them into half-time 23 points up and in pole position to pull off their second major finals upset in as many weeks.